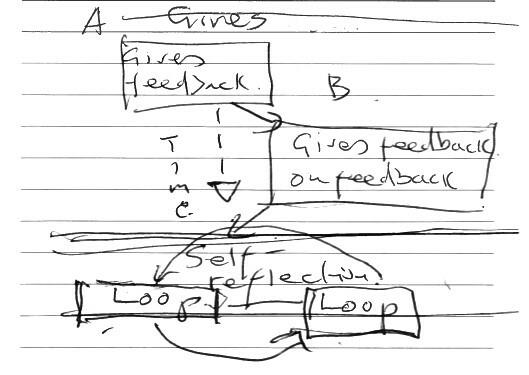 A feedback machine is one where part of the output becomes part of the input. How a person’s behavior is ‘read’ or perceived by others becomes ‘feedback’. There is the idea in feedback of: feeding, eating, feeding-back. Giving nourishing food might help someone to grow, for example. Feeding forward is like kissing someone – kissing can be lots of things says Katrin. 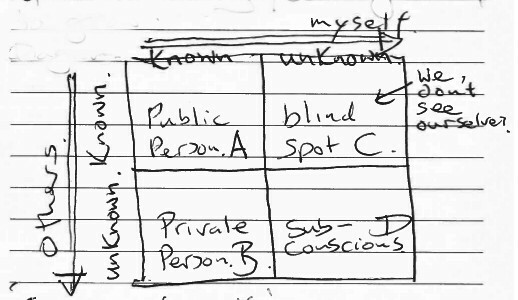 Katrin shows a communication model (1955 American model) – diagram below – and references the book The Courage to Ask, by John Niland and Kate Daly, 2012. We need to be aware that there are filters in our communications with people which can change meaning – perhaps in a way which we didn’t intend. The way a person feels can act as a filter for example. 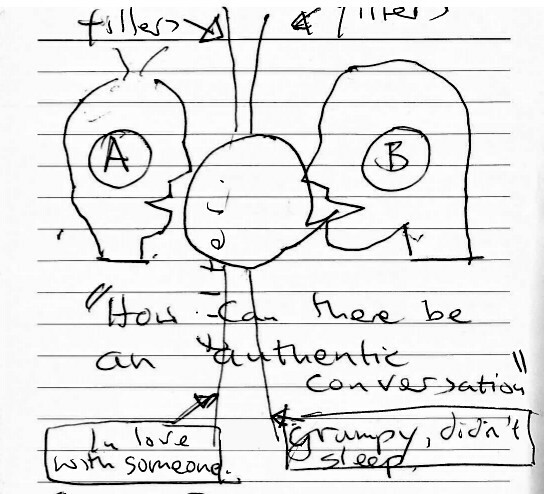 How can we have an authentic conversation given these barriers – the filters? Be aware of your filters (in dancing contact improvisation). We can ask for feedback if none is given. At this festival, we can explore feedback. (Elevator) For example: ‘I saw, it touched me that … I asked myself, I felt. Describe, be factual, be detailed. We work in a group of three people. One person is the ‘researcher’ and their job is to observe the other two people who are in a conversation. One of the two people dances, and the other looks the movement of their joints/limbs and gives feedback to the dancer at after the end of dance. The researcher says what they notice about the feedback. Feedback on the feedback!! I take part in this exercise but the group doesn’t understand the task and we don’t complete it as required! There is no feedback!